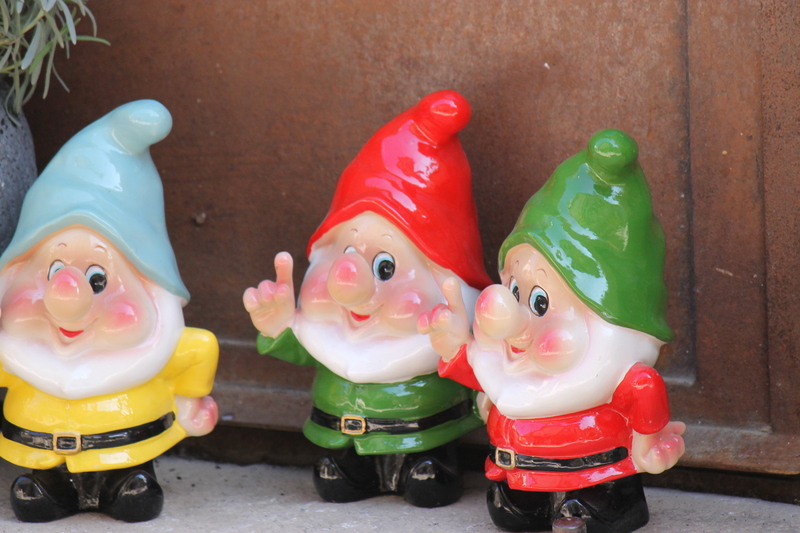 Illustrative purposes only – the neighbours are not gnomes! Chez Guru we have excellent relations with les voisins. We watch each other’s house for raiding parties of Marseillaise burglars, we cordially agree about the height of boundary bushes, and we have convivial drinks every other month. Invariably neighbour number one, we’ll call her Mrs Gnome has prepared some home-made nibbles. She does so with a meticulous attention to detail, sourcing only the finest ingredients, for example Menton lemons to add a little zing to the tomato tapenade. Mr Gnome meanwhile enquires about our latest culinary adventures, ‘have we still not tried Pied Paquets?’ he says with a despairing shake of his head. This convivial state of affairs nearly ended dramatically the other week. A shared dirt track runs between our two houses, separating the gardens, and providing access to the main road. Other than the post man nobody else comes down it. That day, I was driving at my usual snail’s pace, admiring the spring flowers, absent-mindedly watching a hawk floating by on the thermals. I barely noticed Mr Gnome as he came sprinting towards me, hands raised in desperation, face contorted with anxiety. I stopped and Mr Gnome flung himself forwards onto the ground landing with a puff of dust right by my front tyre. I leapt from the car, fearing some unlikely accident. Mr Gnome remained prone, with his arms outstretched. I fumbled for my phone to call the emergency services. As I raised the mobile to my ear I realised that Mr Gnome’s fingers were moving with vigorous purpose across the track, groping for something underneath the car. Finally he picked himself up and dusted down his trousers. In his hand he held half a dozen large snails. ‘That was close,’ he said wiping the perspiration from his brow. I was perplexed. Our neighbourhood is so full of snails that the population can easily take a few hits. ‘But they are just snails’ I said. I nodded. Still not quite sure why Mr Gnome had risked his life for a few snails, I then asked a very stupid question and as I did so I appreciated the panic.